" This self-renewal is a creative driving force that has produced two Rock and Roll Hall of Fame inductions for Mr. Young, and his passion underscores his performance at Massey Hall, providing the framework for Neil Young Journeys. " Neil Young returns to his hometown of Omemee, Ontario to revisit his old haunts and to perform in Toronto's vintage Massey Hall. Young’s intense performances are presented in full, along with passages from the funny and sometimes wistful ride into town. Director Jonathan Demme and Young previously collaborated on two other documentaries, Neil Young: Heart of Gold, which chronicled Young performing in Nashville, the year after he survived a brain aneurysm and Neil Young Trunk Show, which memorialized a Pennsylvania concert during Young’s “Chrome Dreams II” tour. With a music and songwriting career spanning 40 years and 34 studio albums, Neil Young has – as Eddie Vedder once said – “consistently demonstrated the unbridled passion of an artist who understands that self-renewal is the only way to avoid burning out.” This self-renewal is a creative driving force that has produced two Rock and Roll Hall of Fame inductions for Mr. Young, and his passion underscores his performance at Massey Hall, providing the framework for Neil Young Journeys. Premiering at the 2011 Toronto International Film Festival, Journeys follows Young as he drives through his idyllic hometown of Omemee, Ontario to downtown Toronto’s iconic Massey Hall, where he delivers an intimate – and sometimes haunting – performance. The film features an interspersion of concert footage with Young’s childhood recollections, giving audiences an unmasked look at an artist who laments how vastly different his hometown is now compared to the days when he was catching fish and chewing tar. But while the landscape might not look the same, Young finds comfort in the memories that are still fresh in his mind. Though Young’s recollections provide a small glimpse of the lighter side of the songwriting legend, they work best within the context of a biographical understanding of Young’s career. If you’re already familiar with his life and work then you’ll appreciate the irrelevancy of the stories more than a casual viewer who might be looking for more insight into the artist and his songs. The heart and soul of the film truly lie within Young’s concert performances. Armed with little more than a guitar, organ, and harmonica, Young mostly performs songs from his 2010 album Le Noise, but he also delivers solo renditions of classics such as “Ohio”, “Hey Hey, My My”, and “I Believe in You.” The artsy close-ups of Mr. Young’s nose and chin are a little distracting, particularly when he accidentally spits on the camera and it obscures nearly a 3rd of the screen, but aside from that, you will feel like you’re in the front row of the concert. At $10 a pop, such a personal experience is a bargain for any Neil Young fan, especially when you consider how much more people had to pay to see the performance at Massey Hall. 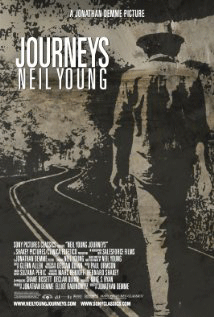 Neil Young Journeys is playing in Memphis exclusively at Studio on the Square. Rated PG for language including some drug references, and brief thematic material.